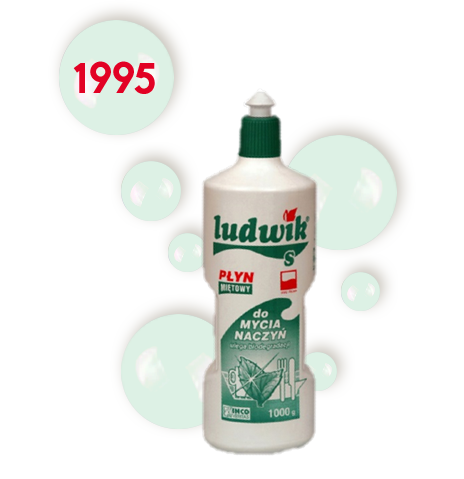 Ludwik appeared on the Polish market in the first half of the 60s, precisely in 1964, a few years following the debut of a washing up liquid on the American market. The co-authors of the invention were Eng. Hanna Majchert and Eng. Zbigniew Korda. Zjednoczone Zespoły Gospodarcze INCO in Warsaw became the holder of the Patent. 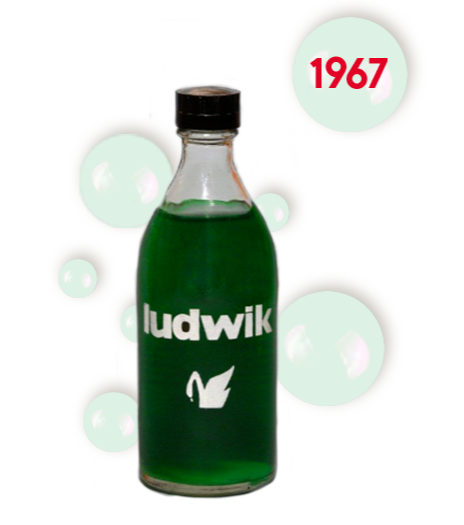 The first Ludwik washing up liquid was available in the mint version, in a 250 ml glass bottle with an decorative checker. 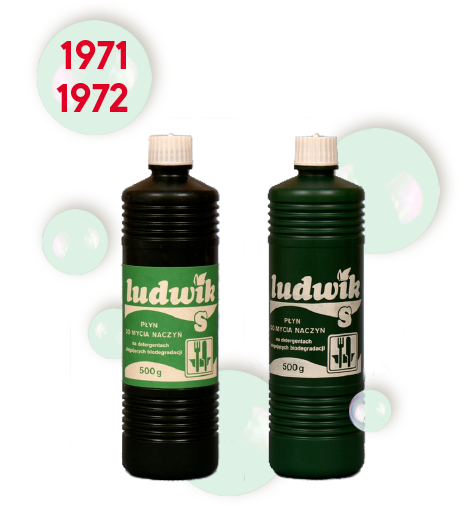 * Ludwik appeared on the market in 1964 and was the first washing up liquid in Poland. The first modification of the bottle took place in 1967. It was slightly refreshed, but still made of glass. Due to an increasing demand for the liquid, it became necessary to look for more modern and practical packages. At the time of PRL, it was difficult to obtain large amounts of raw material for production of the packages, as polyethylene was practically unavailable. The enterprise solved the problem by collecting used artificial fertilizer bags and garden foils, and processing them at its own lines for reclaiming of plastic waste material. In order to preserve the uniform bottle colour, black and green dye was added. 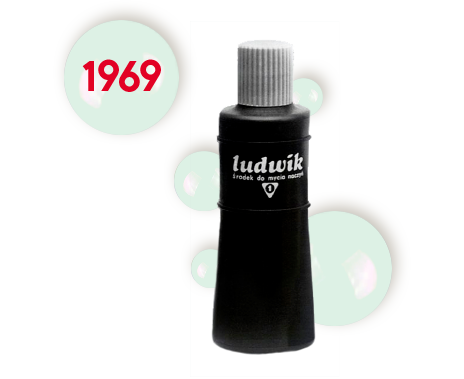 Because of that process, in 1969 the first 250 ml bottle of reclaimed polyethylene with white imprint made using screen printing was created. In the beginning of the 70s the bottles were still made of reclaimed polyethylene, yet with capacity increased to 500 ml, each with a simple paper label. In 1971, both shape and colour of the cap were changed, and the label was slightly modified. In 1972, we returned to the previously used screen print method. That year the colour design of the bottle was also changed, and starting from then the bottles were made of primary polyethylene with an addition of secondary polyethylene. 1992 was a breakthrough, as the liquid was sold in 500 ml and 1 l white bottles, each with a lacquered paper label. They were made using easily available original polyethylene. In order to protect the environment and improve the product appearance, long drying solvent-based paints were withdrawn from production. 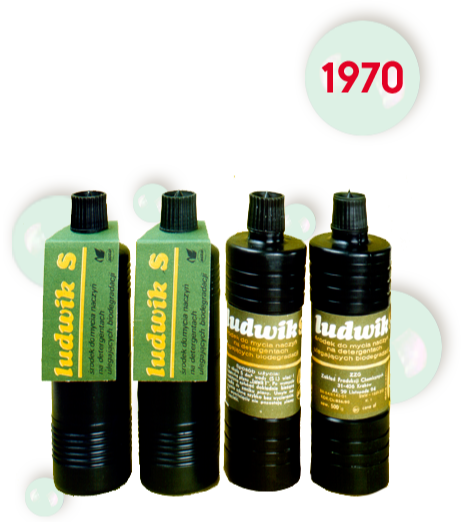 In the second half of the 90s, all Ludwik bottles had a multi-coloured imprint made on modern French screens. Polymer paints used during production were hardened with UV varnish and did not release solvents to the environment. In 1995, the second scent version of the liquid appeared - lemon, and in 1998 - peach. 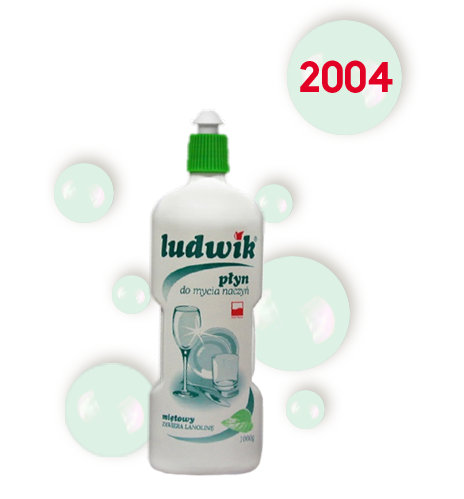 In 2004 Ludwik was refreshed again. 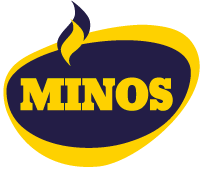 The shape of the bottle and its graphic design were changed. In 2005, Ludwik Grapefruit appeared on the market and in 2008 - Aloe Washing Up Balm. 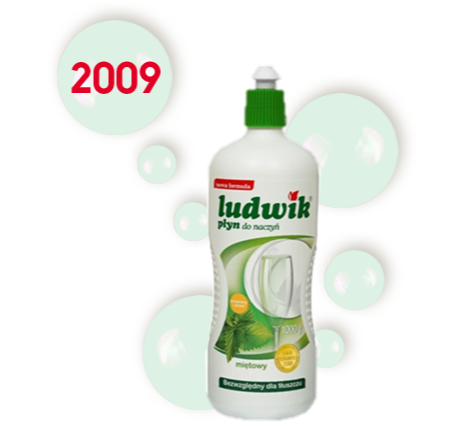 In 2009, Ludwik washing up liquid has changed following Consumers expectations. The white bottle of the product gained a new graphic label design and the bottle shape became more ergonomic and comfortable for users. 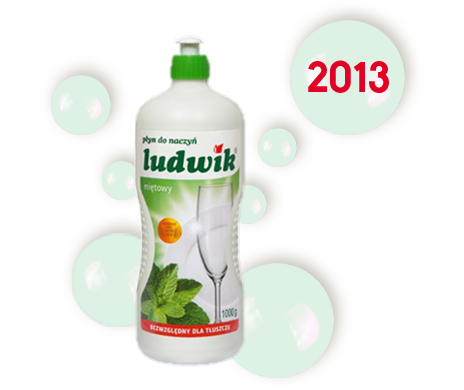 At that time it was introduced to sale new scents of Ludwik washing up liquid e.g. : an orange scent, a lavender scent, a fruit cocktail scent, a strawberry summer scent. 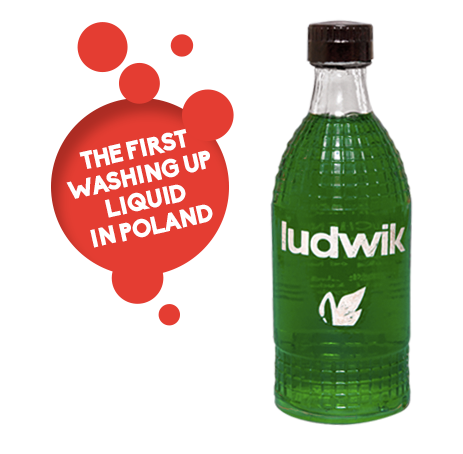 In 2013, Ludwik washing up liquid underwent another visual metamorphosis. 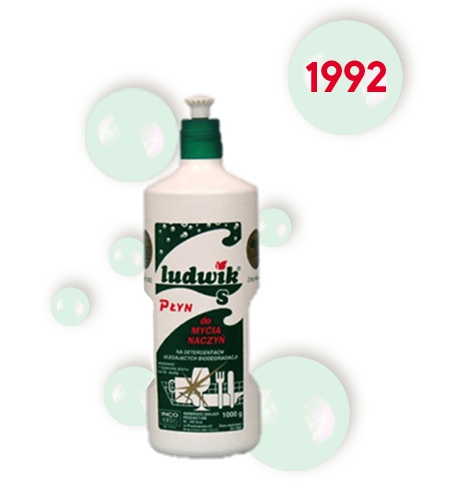 The new design of labels not only increased aesthetic value of the product, but facilitated the consumer to find out quickly on the shelf store the favourite variant scent of Ludwik washing up liquid or Ludwik washing up balm. New attractive image of products ensured its lightness and transparency and also applied repeatability of consistent elements of the products preserved the visual identification of liquids. The cap of the bottle has also changed, it became more ergonomic and visually subtle.